Meet author Patricia Brinkley who will talk about her book Chasing Sleep. Like millions of Americans, do you suffer from sleeplessness? Do you struggle to understand why you cant sleep? What if everything you know about sleep is wrong? 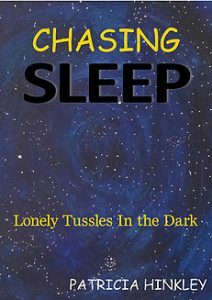 Chasing Sleep is an exploration of the issues and challenges surrounding sleep deprivation and how to overcome them by changing attitudes and behaviors. Written in an inviting, conversational style, the book focuses on how to find peace of mind, the real secret to overcoming sleeplessness. Through research on the history and science of sleep, interviews with ordinary people on their struggles with lack of sleep, and the authors training as a holistic psychotherapist, Chasing Sleep aims to change the conversation from the pop a pill mentality to finding balance and clarity, key elements for living the best life possible.